AL MAHER (AUS) (Bay 2001-Stud 2005). 5 wins-2 at 2, VRC Australian Guineas, Gr.1. Sire of 582 rnrs, 374 wnrs, 34 SW, inc. Delicacy (SAJC Schweppes Oaks, Gr.1), Almalad - Friends of Ka Ying (H.K. ), Fat Al, Diamond Drille, Majestic Music, Budriguez, Silverstream, Classic Uniform, Badawiya, Son of Maher, All Legal, Pheidon, Oasis Bloom, King Lionheart, Monsieur Gustave, Amovatio, Madam Gangster, Speedy Natalie, Felicienne, Marheta, Money Maher, etc. LERICHI, by Savabeel. Winner at 1900m in Aust. Dam of one named foal, one to race. TUESDAY JOY (Carnegie). Top filly on 2008-09 Australasian 4YO+ Classification. 7 wins from 1400m to 2400m, A$3,239,450, STC BMW S., Gr.1, AJC Chipping Norton S., Gr.1, STC Coolmore Classic, Gr.1, Ranvet S., Gr.1, MVRC WH Stocks S., Gr.2, STC Apollo S., Gr.2, VRC Wakeful S., Gr.2, 2d VRC Oaks, Gr.1, AJC Chipping Norton S., Gr.1, 3d Australian Derby, Gr.1, AJC Australian Oaks, Gr.1, Queen Elizabeth S., Gr.1. Producer. MORE JOYOUS (More Than Ready). Champion Middle Distance Horse in Australia in 2011-12. 21 wins-2 at 2-from 1100m to 2000m, A$4,572,450, ATC Doncaster H., Gr.1, Queen Elizabeth S., Gr.1, AJC George Main S., Gr.1, Flight S., Gr.1, ATC Queen of the Turf S., Gr.1-twice, MRC Futurity S., Gr.1, Toorak H., Gr.1, AJC Light Fingers S., Gr.2, Surround S., Gr.2, ATC Breeders Classic, Gr.2, 2d ATC Canterbury S., Gr.1, 3d MVRC Manikato S., Gr.1. Producer. DON'T DOUBT MAMMA (Not a Single Doubt). 7 wins-1 at 2-from 1000m to 1600m, A$640,610, to 2016-17, MVRC WH Stocks S., Gr.2, VRC Let's Elope S., Gr.2, Vanity S., Gr.3, SAJC Redelva S., L, VRC Lexus Hybrid P., L, MRC Foundation P., 2d VRC AV Kewney S., Gr.2, 3d MRC Sandown Guineas, Gr.2. FENWAY (High Chaparral). 3 wins from 1400m to 2000m, A$691,600, ATC Vinery Stud S., Gr.1, MVRC WH Stocks S., Gr.2, 2d SAJC Schweppes Oaks, Gr.1, VRC Myer Classic, Gr.1, MRC Peter Young S., Gr.2, 3d VRC Wakeful S., Gr.2, 4th VRC Australian Cup, Gr.1, MVRC Sunline S., Gr.2, VRC Vanity S., Gr.3, Schweppervescence Trophy, Gr.3. WAR (More Than Ready). Winner at 1300m, A$96,250, ATC Up & Coming S., Gr.3, 2d ATC Breeders' P., L.
MISS DANEHILL (Danehill). 5 wins from 1300m to 2400m, A$362,330, Queensland Oaks, Gr.1, MVRC Guerlain H., Berri Fruits H., Malcolm Johnston H., 2d AJC Colin Stephen H., Gr.3, MVRC William Inglis & Son H., VRC Flemington Summer H., MVRC Gazette H., VATC Health Research Fund H., Midnight Fever 2YO H., 3d MVRC Strathayr H., 4th AJC Metropolitan H., Gr.1. Producer. PENTASTIC (Pentire). 7 wins from 1200m to 2400m, A$1,991,800, VRC Craiglee S., Gr.2, 2d BTC Doomben Cup, Gr.1, AJC Queen Elizabeth S., Gr.1, QTC Brisbane Cup, Gr.1, STC Canterbury Guineas, Gr.1, 3d Victoria Derby, Gr.1, Australian Derby, Gr.1, AJC Queen Elizabeth S., Gr.1. READYTOGORIGHTNOW (More Than Ready). 7 wins from 1200m to 1800m, R685,670, to 2016-17, Kenilworth Winter Guineas, Gr.3, Winter Classic, Gr.3, Fairview Memorial Mile, L, 3d Kenilworth Cape Classic, Gr.3. PRIMUS (Flying Spur). Joint third on The 2005-06 Australasian 3YO Classification (intermediate). 4 wins to 1400m, A$524,780, NSW Tatt's RC Tramway H., Gr.3, 3d MRC Caulfield Guineas, Gr.1, STC Rosehill Guineas, Gr.1, AJC Canterbury Guineas, Gr.1. Sire. JOIE DE GRISE (Kenmare). Champion 3YO Female Sprinter & Older Female Sprinter in South Africa in 1997-98 & 1998-99. 10 wins-1 at 2-to 1400m, R633,465, Scottsville South African Fillies Sprint S., Gr.1-twice, Kenilworth Sceptre S., Gr.2-twice, Scottsville Poinsettia S., Gr.3, Durbanville Prix du Cap, L-twice, 2d Durbanville Diana S., Gr.3, 3d Kenilworth Southern Cross S., Gr.3, Diana S., Gr.3, 4th Kenilworth Merchants S., Gr.2, Kenilworth Fillies Nursery, Gr.3. Producer. BRING SOMETHING (Sebring). 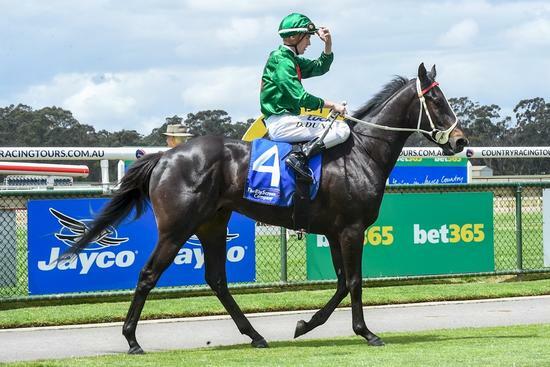 4 wins at 2050m, 2400m, A$404,855, Bendigo Cup, L, MRC Galilee Series Final H., L.
SECRET AGENDA (Not a Single Doubt). 7 wins-1 at 2-to 1200m, A$1,549,400, to 2017-18, SAJC Ubet Classic, Gr.1, ATC Sapphire S., Gr.2, MRC How Now S., Gr.3, VRC Gucci S., Gr.3, Bob Hoysted H., L, MVRC CRT Whites Wires 2YO P., 2d SAJC Sangster S., Gr.1, ATC Sapphire S., Gr.2, MRC Thoroughbred Club S., Gr.3, MVRC Typhoon Tracy S., Gr.3, Champagne S., Gr.3, 3d SAJC RN Irwin S., Gr.3. KEMENTARI (Lonhro). 4 wins-1 at 2-from 1200m to 1600m, A$1,486,250, to 2017-18, ATC Randwick Guineas, Gr.1, Hobartville S., Gr.2, Eskimo Prince S., Gr.3, Seven News 2YO P., 2d MRC Caulfield Guineas, Gr.1, ATC Rubick at Coolmore 2YO P., 3d ATC George Ryder S., Gr.1, MRC Caulfield Guineas Prelude, Gr.3, 4th ATC Run to the Rose H., Gr.2. CUMBRIA (Lake Coniston). 6 wins to 1450m, A$142,880, SAJC Christmas H., Gr.3, QTC Beau Zephyr H., Whetu H., 2d Balaklava Cup, L.
FOREHAND (Bellotto). 9 wins from 1200m to 2200m, A$199,250, Kalgoorlie Gold Cup, L, Kalgoorlie Boulder RC Boulder Cup, L.
PRESENTING (Redoute's Choice). 5 wins-1 at 2-from 1200m to 2050m, A$142,850, SAJC Morphettville Guineas, L, MRC Black Onyx 2YO H. Producer. CASK (Fort Wood). 3 wins from 1450m to 1800m, R529,845, Kenilworth Premier Trophy, Gr.2, 2d Kenilworth Premier Trophy, Gr.2, Enjoy Cape Racing H., What a Winter P., International-Racing SA/WPOTA H., 3d Greyville Thukela H., L, 4th Clairwood Cup Trial, Gr.3, Fairview Algoa Cup, Gr.3. BENTLEY BISCUIT (Peintre Celebre). Third on the 2006-07 Australasian 4YO+ Classification (sprint). 12 wins from 1100m to 1600m, A$1,446,725, AJC TJ Smith S., Gr.1, BTC Cup, Gr.1, AJC All-Aged S., Gr.1, Shorts H., Gr.3, Avenium H., STC Winning Edge Presentations Welter H., Nick Robin Memorial H., Young Members Raceday H., De Bortoli Sacred Hill P., De Bortoli Wines H., 2d Newcastle JC Newmarket H., Gr.3, 3d AJC Doncaster H., Gr.1. GOLD ALLOY (Testa Rossa). 6 wins from 1350m to 1700m in Macau, Macau Guineas, L, 2d Macau Derby, L.
THORN PARK (Spinning World). 9 wins-2 at 2-to 1500m, A$1,535,725, QTC Stradbroke H., Gr.1, BTC Cup, Gr.2, AJC Hobartville S., Gr.2, STC Phar Lap S., Gr.2, Premiere S., Gr.2, MRC Moonga S., Gr.3, STC Member for a Day H., Club Seven Hills 2YO H., 2d AJC Up & Coming S., Gr.2, Expressway S., Gr.2, 3d VRC Australian Guineas, Gr.1, Emirates Classic S., Gr.2. Champion sire. Race Record: 2 Starts 0-0-0 A$625.